The Palms of Destin is one of the newest resorts and boasts the largest lagoon pool in Destin. 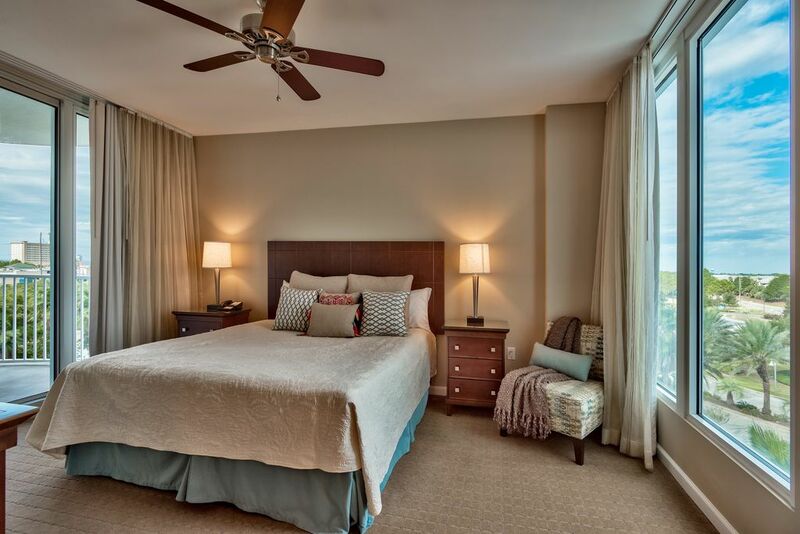 This newly renovated condo is complete with designer furnishings and bedding throughout. Featuring a Master king suite with private bath and balcony, king size bed in second bedroom, and a new queen sleeper sofa in the living area. Unwind on the spacious balcony with unsurpassed views from the living area and master bedroom of the lagoon pool and the emerald waters of the Gulf of Mexico. Stay fit on your vacation in the 2265 square foot spacious state-of-the-art fitness center, relax at the spa, or just kick-back poolside with your favorite cocktail. There are other activities including lighted tennis, full size basketball court and a newly built kiddy playground. Other amenities include seasonal complimentary shuttle to Henderson Beach State Park where you can grill and picnic. Your vacation is destined to be filled with Sand. Sun. Fun. Repeat! Don’t Wait! You Deserve a Vacation! We loved this place. Everything was available that is needed! Beds were comfortable and everything was very clean. The only issue was trying to close the very heavy sliding door. It needs to be heavy for the storms that come to that area, so it is understandable. The company was easy to work with and would use them again. Overall we were satisfied with the condo. We were notified when we first checked in that the ice maker and water didn't work on the refrigerator. The ice maker was fixed the next day, but the water on the refrig did not work for the two weeks were there. My family of three had a nice time at The Palms. The only issues were the dryer and the wifi. When we tried to use the dryer it started making a clunking sound after running for 20 minutes or so. Also, the wifi is not good at all. I know that we could have upgraded, but it seems like good wifi should be standard in this day and age and not a privilege. Other than that our stay was great. The Palms is in a good location, there were plenty of amenities, it was clean, service was friendly, and the amount of space was perfect for our family. The unit was very nice. Two things I had a problem with was so many remotes to operate the televisions and the a/c going out was the only two problems we had. The management company was slow on response. We really enjoyed our stay, and thought the accommodations were great. The location was perfect, though I wish we had access to chairs and an umbrella for one of our beach days. Otherwise, we would stay here again!